I served an Aperol Spritz (sounds way fancier than it is, see below for recipe) in a Double Old Fashioned glass. Cheesy Poblano Chiles stuffed with Grilled Shrimp. Recipe below. Brush chiles with olive oil and place on hot grill (or iron skillet on the stove) skin side down. Coat shrimp with remaining olive oil, add garlic, salt and pepper and skewer individually; place on grill. Keep chiles and shrimp on grill for about 10 minutes until just before chiles are charred or blackened and shrimp is grilled and golden brown. Sprinkle the cheese inside the chiles. While the cheese is melting, remove the shrimp and squeeze lemon half over the shrimp and sprinkle with maldon salt right after they come off the grill. Once cheese is melted on chiles, remove chiles and arrange shrimp on top. Serve. Alternatively, you could remove the chiles with the cheese and allow guests to place their own shrimp or other toppings (**see below) of choice. **My favorite part about this recipe is the variations that it lends itself to. I've made this with salmon, shrimp, crab, or sausage as the meat and have used pretty much any cheese I had on hand. It's a fun recipe that can be made a variety of different ways. 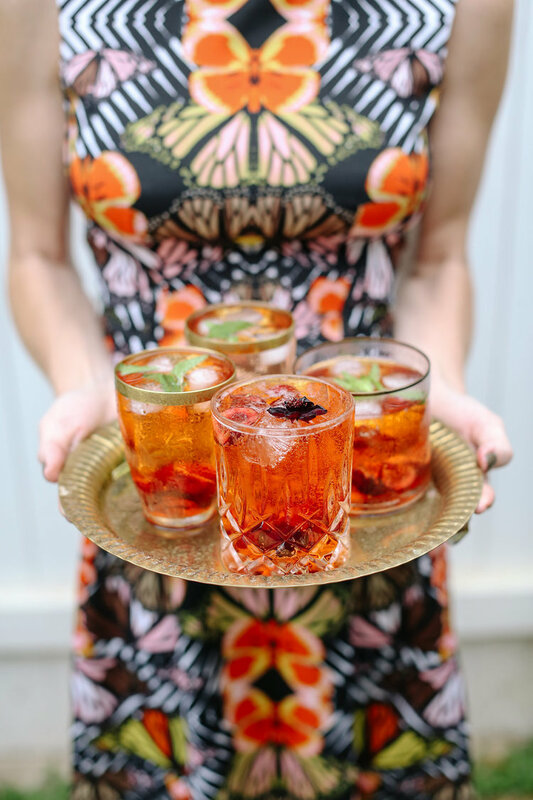 Aperol Spritz served in Double Old Fashioned glasses and garnished with chocolate cosmos and mint. See recipe below. This cocktail is one of those impressive drinks that is easy to make and doesn't require a lot of prep, mixing, or measuring. When I'm trying to pull together an easy afternoon gathering I really try to choose recipes that are forgiving and let you adjust to your taste without compromising the integrity of the drink. If you like a stronger, herbal flavor; go heavier on the aperol. If you like more sparkling wine, just splash in the aperol and club soda for flavor. My preferred ratio is heavy on the sparkling wine, 1/2 oz. aperol and a splash of sparkling. You can serve it in a wine glass, a tumbler, double old fashioned or even a coupe. The drink should be served chilled and cold so I would recommend serving with ice. If you went with the coupe route, just make sure your bottles are chilled. Garnish with some sort of fruit. Citrus is typical, but I muddled some cherries beforehand beacuse I liked the contrast of a darker color. Dressbarn DRESSBAR butterfly fit and flare dress paired with black studded boots. I'm not kidding, I was really excited to match the drink to the dress! This doesn't always get to happen, so I was pretty pretty pumped about such a fun colorful dress matching the Aperol Spritz! Get the Butterfly Fit-and-Flare Dress look! Thanks for checking out my version of entertaining easy!